If you are already planning to begin sprucing up your house for Christmas and you have got enough time to ditch pre-made stuff, it’s a fabulous idea to make your very own decorative elements with a special personalized touch. And, building such pretties is surprisingly easy when you get your hands on these 5 different Christmas decorations that will make a definite statement! Putting some of the basic items lying around the house to a super-innovative use is what this incredible YouTube video by Innova Crafts is all about. It teaches you to make 5 stunning Christmas decorations, including a paper Xmas tree, ornaments, wall decor piece, and lovely snowflakes – all with the idea of recycling! The initial glimpse at the extraordinary Xmas tree showcased in the video won’t let anyone figure out that it’s actually a magazine subjected to a little origami! You fold each of the pages of a magazine in a super cool pattern, and somehow, it will magically start to transform into a vintage-looking Christmas tree that can give just about any store-bought table-top tree a tough deal of competition. For the finishing touches, you can coat the tree with your choice of spray paint and mini DIY ornaments. Here, Innova Crafts adorns the tree with little paper glitter stars that make things even more whimsical. Who said you always needed to go for a floral wreath or hard-to-pull-off mantel decorations? A rustic yet adorably blingy Christmas star whipped up using tree branches or sticks is perhaps, the easiest crafts to pull off with your kids. The sticks are spray painted in white, arranging them together in a star shape, wherein each of the sticks are wrapped with string lights and connected with each other using small pieces of wire. Simply charm the star up with decorative leaves or berries, and voila! 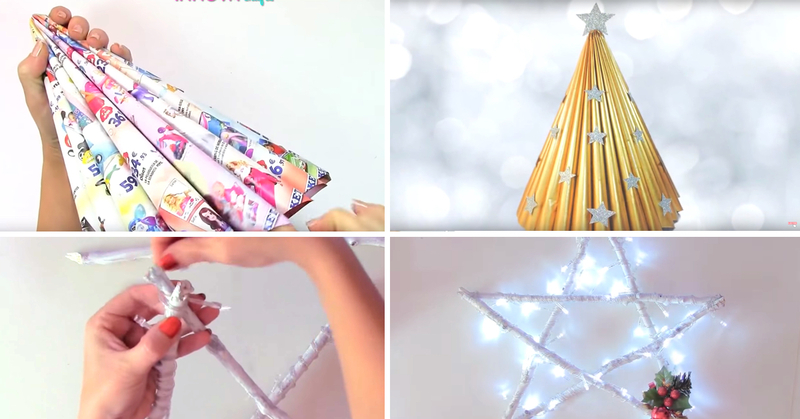 5 DIY Christmas Recyclced Decoration! The tutorial also takes you through two different festive ornaments made out of toilet paper rolls. The key is to flatten the roll and cut smaller loops out of it, letting your creative juices flow when it comes to assembling them. One of the ornaments combines the pieces into a ball, while the other assembles them into a dense snowflake. Splashes of paint and coats of glitter make the ornaments oh so splendorous, getting them ready-to-hang using strings or threads. Last but not the least are glorious homemade snowflake ornaments that are going to adorn your Christmas tree with a touch of sparkle. Grab a ceramic dish and use a marker to draw a snowflake design on the dish with simple lines that all connect with each other. Apply some oil over the snowflake outline, further placing a looped string atop the design. All you need to do next is to trace the image with hot glue in a continuous stream, sprinkling loads of glitter on top while the design is still wet. Once the snowflake is dry, you are all set to hang it on the tree! Decorate your space with the aforesaid projects or gift them to your loved ones, spreading some Christmas joy around!